So just make suggestions for call cards and white cards here, since I can't remember how to make it so anyone w/ a link can edit a deck. I'll add them to the deck as they're posted. And here's the code for whenever we wanna use it: MQU2D. To use a Cardcast deck, before starting the game the host will type /addcardcast 5CODE, where 5CODE is the 5-character code (in this case MQU2D), then hit Enter to add it to the decks to be used. EDIT: Gonna have two lists here; one for call cards, and one for white cards. That way everyone can see what's already in the deck :3. Finally, I have created _ -flavored pie! 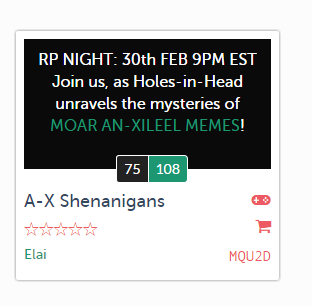 RP NIGHT: 30th FEB 9PM EST Join us, as Holes-in-Head unravels the mysteries of _! The Hist just gave me the best vision about _! Now available from the Coin Brothers Cornerclub, _! Why did the Coin Brothers kick us out? _. You know, if we took _ and combined it with _ , we could totally rule all of Nirn. Well, I just saw _ and I don't think I'll ever be the same. Everyone gather at the Hist, we're having an emergency meeting about _. Forget Vampirism or Lycanthropy, _ is the hot new thing to be infected with! What nearly caused the An-Xileel to disband? _. If you bring up _ one more time, you're being kicked from the Guild. _ + _ = _. Come on and _ , and welcome to the _! _ , _ , and _ ; the greatest weapons the An-Xileel posses. Where did all the _ go? 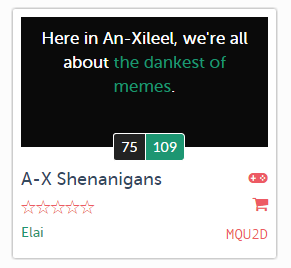 Welcome to the newest member of An-Xileel, _! How many times are we going to have to deal with _? I hope the next character arc is about _. Well, I wasn't expecting to deal with _ during tonight's RP. If you want _ , you'll need to go to _ and talk to _. 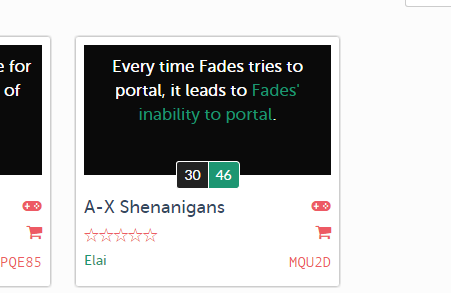 Every time Fades tries to portal, it leads to _. Come, erect the spine of _! Here in An-Xileel, we're all about _. _ , the Hist's secret weapon. Black Marsh is being invaded by _! Quick, we have to use the power of _ to stop them! Fades and Darmah won't let us visit their house anymore after the incident with _. All the Magicka users in An-Xileel are working on a new spell called _.
I just need to get my hands on _ and my fantasy will become reality! 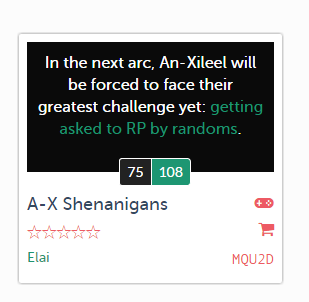 In the next arc, An-Xileel will be forced to face their greatest challenge yet: _. The Hist gave the most cryptic vision of _ and _ last week. _ has a secret lovechild with a Khajiit. Not sure if that's possible but the Hist would weep. _ has claimed their tail was chopped off and had it grow back again, but it's only to gross out and impress the Nords. _ repaired a Dwarven automaton to function as the Treeminder. Never again, and the Hist still weeps. _ is a bit too affectionate to their Guar. Guards are also concerned. _, _ and _ return from a Wamasu punching party. _ is also a Shadowscale. Like doubly. A Shadowshadowscale. _ is actually a Worm Cultist in secret. _ and _ act out some of the scenes of the Lusty Argonian Maid for the rest of the guild. Its a classic play and enriching to our culture. Shakespearean, even. _ made off with the Guild monies again. _ and _ passed out drunk on each other after a rousing game of shot for shot. Eventually they find out awkwardly that both of them are pregnant. The Hist weeps with happiness. _ just got ganked in PvP. Turns out it was _ on another character. How sneaky! _ spends way too much time buffing their scales and preening to look just right for Guild gatherings. _ 's tail has a mind of its own. It is involved in a conspiracy to become Emperor! _ has been banned from future Guild meetings for repeatedly trying to hammer out dents in other people's armor while they're still wearing it. _ mistakenly brings up anachronisms of the 4th era. Again. What are we? Time travelers? _ has a hidden lockpick despite not wearing clothing. The guards are hesitant to search them further after confirming its not in their mouth. They say the Hist weeps with happiness when _ and _ have their hatchlingdays but _ keeps insisting the Hist is a giant Argonian dung pile. _ saved all their hard-earned gold only to fritter it away on consorts dressed like maids. _ is complaining of accidentally deconstructing something valuable again. _ has been caught smoking skooma. _ is trying to mooch. The guards are repossessing stolen clothing from _, again. _ fell in love with a turnip because of Sheogorath. _ and _ are in cahoots with the slavers. On looting a chest in the Imperial City, _ aggroed the wandering boss. What a scrub. _ is now a Werelemon. Why did Crow Mother kick us out? _.
I really want to see _ released in the next DLC. Argonians already have _ and _ . Only _ could possibly make us better. The community has been raging ever since ZOS removed _. Crow Mother has been working on a cure for _ lately. Side effects may include _ and _. If I have to listen to _ going on about _ again, I’m going to go crazy. 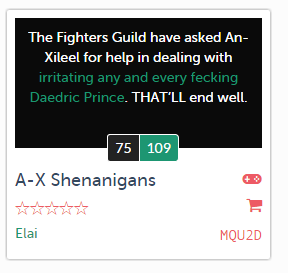 The Fighters Guild have asked An-Xileel for help in dealing with _. THAT’LL end well. _ has a new addiction to _. Speaks has recently started trying to learn _ spells, so far with minimal explosions. Okay, so maybe a Guild event revolving around _ wasn’t such a good idea. We’ve finally decided that we’re calling Crow Mother’s realm _. What almost killed Speaks THIS time? _.
It’s a well-kept secret that the An-Xileel collectively fears _. Why is everyone naked? _.
I’d like to see a _ -style Motif. The cause of the Dwemer vanishing was clearly _. _ nearly got us all killed last RP night after that _ nonsense. I keep having to tell _ to keep _ out of _. Finally! I have created a _____ flavored pie! Join us, as Holes-in-Head unravels the mysteries of ______! The Hist gave the most cryptic vision of___ and ___ last week. White card: "Internal gentiles" "Showing affection through tail wrapping"
__________ is now a werelemon. On looting a chest in the imperial city, __________ aggroed the wandering boss. What a scrub. __________ and __________ are in cahoots with the slavers. __________ fell in love with a turnip because of Sheogorath. The guards are repossessing stolen clothing from ___________, again. __________ has been caught smoking skooma. ___________ is trying to mooch. __________ is complaining of accidentally deconstructing something valuable again. __________ spent all their hard earned gold only to fritter it away on consorts dressed like maids. They say the hist weeps with happiness when ___________ and __________ have their hatchlingdays but __________ keeps insisting the hist is a giant argonian dung pile. __________ has a hidden lockpick despite not wearing clothing. The guards are hesitant to search them further after confirming its not in their mouth. __________ mistakenly brings up anachronisms of the 4th era. Again. What are we? Time travelers? __________ has been banned from future guild meetings for repeatedly trying to hammer out dents in other people's armor while they're still wearing it. __________'s tail has a mind of its own. It is involved in a conspiracy to become emperor! __________ spends way too much time buffing their scales and preening to look just right for guild gatherings. __________ just got ganked in pvp. Turns out it was __________ on another character. How sneaky! __________ and __________ passed out drunk on eachother after a rousing game of shot for shot. Eventually they find out awkwardly that both of them are pregnant. The hist weeps with happiness. __________ made off with the guild monies again. __________ and __________ act out some of the scenes of the Lusty Argonian Maid for the rest of the guild. Its a classic play and enriching to our culture. Shakespearean, even. __________ is actually a worm cultist in secret. __________ is also a shadowscale. Like doubly. A shadowshadowscale. __________, __________ and __________ return from a wamasu punching party. __________ is a bit too affectionate to their guar. Guards are also concerned. __________ repaired a dwarven automaton to function as the tree minder. Never again, and the hist still weeps. __________ has claimed their tail was chopped off and had it grow back again. Only to gross out and impress the nords. __________ has a secret lovechild with a Khajiit. Not sure if possible but the hist would weep. All right, I *think* I have everyone's characters listed as white cards. If I've overlooked you please poke me so I can add you (if you want, that is). Should I add To'Raji, Salyyn, Aether, Kiju, Do'ashi, Telum, and pretty much any other characters that are relevant (or will most likely become so) to some extent?